Current computer memory technologies are fast approaching their physical storage capacity as consumers demand smaller and higher capacity devices. The standard existing computer memory technologies are based on silicon and require a large amount of energy to store information on a computer’s magnetic hard disk drive. Information is captured and transferred to the hard disk drive either via electronic or magnetic methods, each with their own advantages and limitations. The next generation computer memory could combine electric and magnetic properties in one component in order to create more energy efficient devices which would in turn be able to support the storage of more data. Dr Lynette Keeney is a University Research Fellow based in Cork, Ireland and is supported by the Royal Society and Science Foundation Ireland. Dr Keeney aims to optimise a new material she has developed which contains both ferroelectric and ferromagnetic properties at room temperature in order to produce a more efficient memory storage technology for today’s modern computer needs. Some such multiferroic materials currently exist but are extremely rare due to the conflicts of interest found at an atomic level in these materials. Work conducted by Dr Keeney prior to receiving her University Research Fellowship found that by inserting manganese atoms into these structures, she was able to control the ferroelectric and ferromagnetic properties of these rare materials. The regulation of these multiferroic properties forms the basis of Dr Keeney’s University Research Fellowship where she was recently able to map out the locations of magnetic and non-magnetic atoms in the multiferroic material through the use of a high powered atomic microscope. By understanding the innate structure of these complex materials, Dr Keeney aims to increase their energy efficiency with a view of transferring them from the lab into real consumer devices. ‘Your work should span a fundamental problem but should also clearly have a real world output,’ advises Dr Keeney. The encouragement and support from Dr Keeney’s colleagues was the driving factor in applying for the University Research Fellowship after she saw an advert from the Royal Society and Science Foundation Ireland encouraging talented early career researchers based in Ireland to apply. 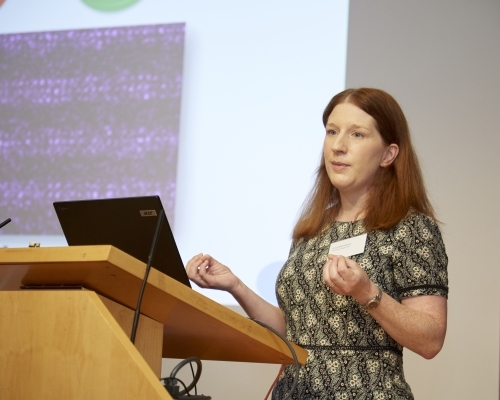 The flexibility of the University Research Fellowship meant that Dr Keeney was able to undertake a period of maternity leave in 2017 where her project was placed on pause and she was able to take the time she needed to spend with her newborn without worrying about funding running out or pressure to return to work. Dr Keeney notes this smooth, stress-free process of changing to flexible working hours is not commonly found amongst funders and highlights this as a key advantage of the University Research Fellowship. ‘You are given the freedom to concentrate on the science and the trust to run your own project,’ Dr Keeney explains. In the future Dr Keeney hopes to apply for further funding from organisations including Science Foundation Ireland and the European Research Council and notes that the prestige of receiving funding from the Royal Society will be a great advantage in pursuing additional funding in the future.